A step-by-step guide on how to buy ELIX on Kucoin.I want to give you a little step-by-step guide on how to buy ELIX, which is becoming more and more popular. The easiest way to get started is by creating a Coinbase account and buying some Bitcoin or Ethereum. 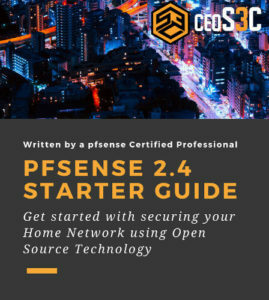 You can follow my previous guide on how to do that. After creating a Coinbase account, you can also create a GDAX account, which is a daughter firm of Coinbase, to save on some fees. Although I would recommend doing your first transaction using Coinbase, just to get a feel for it. Once you are done with it, we continue to transfer this currency to an exchange. 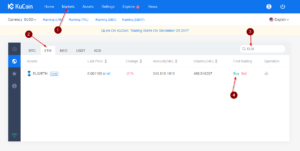 I only had good experiences with Kucoin so far, it is one of the fastest Exchanges I’ve used so far. Don’t forget to activate 2 Factor Authentication first thing after creating your account! After you have created an account with them, click on Markets / Select ETH or BTC depending on what you bought on Coinbase / Type ELIX in the search field / Hover over Buy to open up the buying window. 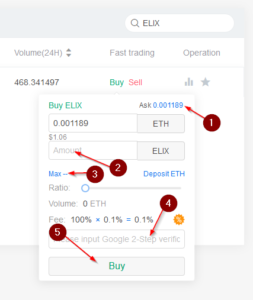 Click on the latest Ask price to automatically fill in latest price / Enter the amount of ELIX you wish to buy or click on the Max button to use all your ETH to buy ELIX or adjust with the Ratio slider / Enter your Google Authenticator Code / Click buy. Congratulations, you are now a proud owner of your first ELIX tokens. Don’t forget to safely store your Cryptocurrency and invest responsibly!